I am a DEFRA-approved Official Veterinary Officer and have even worked onsite at London Heathrow Airport preparing cats for their flight, so I am more than qualified to help you ensure your cat is ready for travel. Whether you are emigrating "down under" or spending the summer in Europe, I can help to make sure your cat is prepared! Strict requirements need to be met prior to travelling with your cat. These vary with your chosen country of destination and whether or not you plan to return to the UK at a later date. 1: Where are you travelling to? 2: What are the specific rules for your planned route? The UK has been free from rabies for many years, but because of the existence of the disease in other countries there is a continued need for an effective system to be in place to manage the risk of it being introduced by imported animals. For this reason, strict rules are in place to keep the UK free from rabies and certain other exotic diseases. Generally speaking travel within the EU is reasonably straight forward under PETS (Pet Travel Scheme). he Pet Travel Scheme (PETS) permits the entry of pet animals from qualifying countries into the UK without quarantine. It also entitles people in the UK to take their pets to the European Union (EU) and participating countries, and return with them to the UK. If travelling outside the EU, you may need to comply with additional legal requirements, including blood tests, waiting periods, import permits and export health certificates. 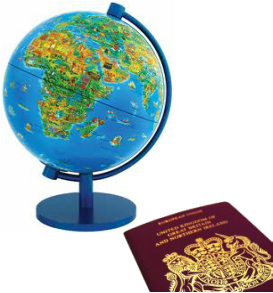 DEFRA supplies comprehensive information about travelling with your pet to non-EU countries. Cats entering the UK must do so via a route and means of transport that is authorized by the Animal Health and Veterinary Laboratories Agency (AHVLA) who are responsible for checking that the animal meets the rules of the Scheme. NB: You are not permitted to bring a pet into the UK on a private boat or plane from outside the UK. The following links may prove useful in ensuring your cat is kept as stress free as possible during transport. BSAVA "Advice for Taking Your Cat in the Car"
Pre-entry tick treatment is not required from 1 January 2012; however, it is advisable that cats are protected against ticks as certain European ticks can carry serious diseases, some of which are zoonotic (can spread to humans) . Tapeworm treatment is not an entry requirement for cats travelling in the EU, only dogs. That said, I continue to advise clients to treat their cats against a range of parasites, especially when travelling abroad. I recommend that cat owners contact the relevant authorities of the country they are travelling to for any additional entry requirements. I have put some links to the appropriate organisations under the individual country categories mentioned above. Owners are always responsible for making sure they have the necessary documentation for their cat to re-enter the UK. The information I have compiled is intended for cats only. Different rules may apply for other animals (such as dogs). Always plan well in advance! Have you got a copy of my Travel Checklist? Always consult DEFRA for the latest information about travelling abroad with your cat.